Laser Scribing ceramic substrates has been increasingly popular since its introduction to the industry nearly 50 years ago. The process involves pulsing a CO2 laser through an optical configuration, through a focusing lens, focusing the beam through an air assisted nozzle assembly, and finally onto the substrate's work surface. Most Laser scribing systems utilize a CNC or PC based motion control system, moving the substrate below the fixed beam assembly at speeds as fast as 10 in./sec, or faster. Each pulse of the Laser provides an efficient and effective evacuation of molten and ablated ceramic substrate particulates. Well executed scribes allow for subsequent controlled Breaks, or “Snapping”, of the substrate to its final size. Laser Scribing in History: in 1964 Kumar N Patel Invented the CO2 LASER while working at Bell Labs. Is Laser Scribing right for your application? Consider the following factors when determining if laser scribing is the best option. A laser scribed edge is not smooth, as at least one side of the edge is scalloped. 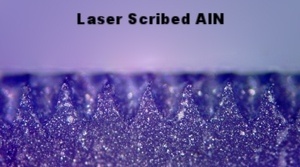 If any kind of substrate particulate that could break away from a Laser Scribed edge has the potential to be detrimental to the part or its eventual environment, then a Laser Scribe is not recommended. If a smoother edge is required, consider a diamond sawn edge or laser cut and subsequently annealed or clean fired edge for higher edge quality. Due to the many factors pertaining to the subsequent processing of substrate materials, I suggest speaking with an expert to determine if Laser Scribing is a good fit for your specific application. A Laser Scribed surface has a heat affected zone local to the scribe, so careful consideration is recommended if there are critical areas on the substrate surface within .005’’ of the scribed edge. Laser Slag or molten ceramic particulates on the surface can be minimized using a protective coating; a water soluble emulsion is typically used. To be certain that “all” laser slag/particulate is removed from the surface, a subsequent “scrubbing” of the work surface is often what is needed to provide an optimal surface conditions for most applications. Smaller Parts (less than 0.4’’ or 1 cm in dimension) are easier to achieve when utilizing a deeper scribe and tighter pulse to pulse spacing. Will parts be separated by hand or in an automated or semi-automated system? Automated systems can handle a more robust substrate and pulse depth can be specified on the shallower side, or even less. However, with shallower scribes, it’s important to have tighter spacing. Using a multi-up configuration allows the customer to snap the substrates to size after they have completed building and processing the component. When scribing a substrate in a multi-up configuration, it is important to control the scribe parameters to an even greater degree. While the average scribe depth for a clean and successful “snap” is still in the 30% to 50% range of the substrate thickness, making certain that pulse spacing is properly aligned with materials thickness becomes of greater importance. 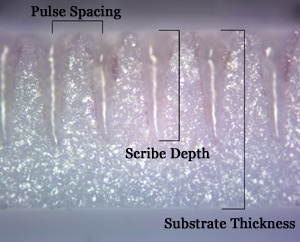 If pulse spacing is too tight or if pulse depths are too deep, then the substrate may break prematurely with subsequent processing of the substrate material. Example: Multiple screen print and firings of conductive, dielectric, and resistive materials on the substrate may result in premature breakage. Often a Laser Scribed substrate appears yellowish, gray, or even black on the substrate surface. For many, this is not an attractive part of the Laser Scribe process. In many substrate materials, the scribe can appear far more “clean,” or less oxidized via utilization of proper assist gases. Oxygen, Nitrogen, Co2, and other gases or blends of gases and shop air can help to achieve a cleaner looking scribe. Clean Firing of the substrate materials, where substrates are loaded or cycled through a furnace at elevated temperatures over an extended period of time, can also “clean” the scribes along with the substrate surface. In critical applications, a subsequent “annealing” of the substrate can be performed, but I strongly suggest consulting a professional if annealing is a consideration, as annealing introduces a need for a revised set of laser scribe parameters in order to achieve success. Pulse spacing and pulse depth, which are labeled on the 96% alumina substrate to the right, can and should be controlled very tightly. Each application of the Laser Scribing process has the potential to yield ongoing “exact” results when controlled properly. 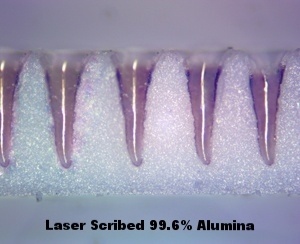 If you are unsure about the meaning of these terms, the scribed 96% alumina substrate shown here has pulse spacing, scribe depth, and substrate thickness labeled. Tighter controls will produce better and far more consistent results. Pulse Depth can be controlled to a tolerance of +/-10% of the materials thickness. The Laser Scribe is the most cost effective method for sizing ceramic substrate materials, other than tooling up for a “Green Scored” ceramic substrate, which adds the upfront cost of tooling from the manufacturer. Take advantage of the many benefits of laser scribing or laser machining for your next application. There are a lot of things to consider before having your substrates laser scribed, so don’t hesitate to contact us. Start the conversation with us today and we can work together to figure out the right process for your needs. There are several manufacturers of ceramic materials and all offer standardized substrate sizes. Centerline Technologies inventories many different sizes of most major manufacturers’ substrates. We are also able to provide custom sized substrates with a rapid turnaround.